I finished my first quilt. I didn't add batting and I quilted it myself, but it still totally counts as a finished quilt. I highly recommend that you know the number to your local Poison Control Center so that when your 18-month old drinks a large amount of 409 cleaner you can call and set your mind at ease that it's okay that he's vomiting, 409 is just detergent and soap and that probably upset his stomach. A bath and a milk bottle will cure him. Trick or treating in our area is always a scheduled affair by the city and rarely falls on the actual date of October 31. This year it is on October 27 from 4:00pm to 6:00pm. I am just a little peeved because I could really use those extra four days to get the costumes sewn. As it stands now, I have two costumes to finish between innings of the World Series. Have you thought about Christmas gifts yet? With five kids I start thinking early and hit sales when I see them. I need some fresh ideas for the kids that aren't LEGO related (since I already hit the buy two get one free sale at Toys R Us). The older boys want iPods, but at $250 each I was like, "Yeah, you'll get those from me never." Did you have a chance to enter my giveaway yet? No? Then you are really missing out on a cute (and free!) holiday kids book. Even if it's not your style, chances are that you know someone who would like it. Click here to learn more details about the giveaway! 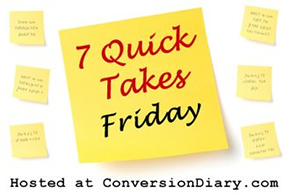 Head over to Conversion Diary to read more Quick Takes! The 409 story makes me shudder! When Michael was about 6 weeks old, maybe less, I gave him tylenol and then had all these panicky moments about whether I'd overdosed him. Two nights in a row I called poison control at 2 a.m. They must have thought I was freak. #3: I never understood the scheduling of Halloween and trick-or-treating that we had in Ohio. It seemed weird to me. #4: :D I talk all about the games this week in my Quick Takes. I'm from the San Francisco Bay Area originally and took absolute joy in the fact that the A's were knocked out of the play-offs. Jealous of your quilting and your little boys. I'm hanging around to lurk your older posts. Glad I found you on 7 quick takes. That's a really good idea about the poison's phone number to hand, I recently spent two days in hospital with an already compromised 2 year old when she swallowed 22 of her aspirin!! Fast action is crucial. In regard to a few Christmas ideas, I have 6 children and my last post was what was successful as regards toys in our family over the years. I never post my link on other people's blogs but I guess if you click my name you'll come to it. I'm in full Santa mode just now, I try to have the majority done before the start of advent then ban all talk of I want I want. Good to know about the 409. I dislike Halloween for the very fact that in addition to clothing my children all year long, on this one night I need to find some clever costume to clothe them in...and then wash that too. lol! So scary about the 409. So glad it turned out okay! That is fantastic about the quilting! Quilting is something I've long wanted to learn, but haven't found the time yet.